The cat or the husband? This entry was posted on Friday, May 4th, 2007 at 3:59 am	and is filed under Cats, National Dog, Cat & Pet Info, Art & Pictures of Cats & Dogs. You can follow any responses to this entry through the RSS 2.0 feed. Both comments and pings are currently closed. Oh, without question, I would keep the cat! The husband is pretty cute but I am more partial to orange tabbies. My husband knows not to make this particular ultimatum. Haha, my husband also knows not to make that ultimatum. definitely the cat. maybe that’s why i’m divorced with 5 cats?! The cat wins paws down! itchmo, thanks for adding a little humor !!! She’s married to the wrong man. The cat wins - the cute husband goes. ok, that is too funny. 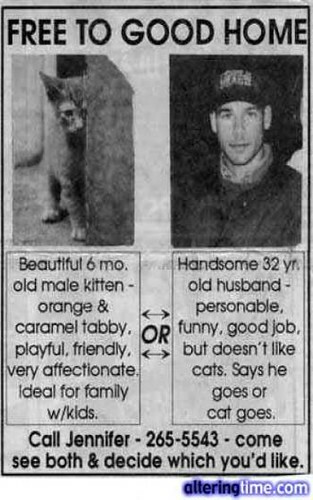 Id take the cat, anyday :). Well, the guy is cute, but I already have a husband who loves cats. So yea, I’m up for the tabby too. Poor little kitty. The guy has a job, he’ll do fine on his own. Definitely the cat. I confess to being a cat lady looking for a cat man. Zenelvis, I have often wondered about that. But you aren’t alone - my DH loves cats and has had them all his life. We have three now and he keeps talking about getting a couple more! upstairs with the cat.. shortly after me and the cat moved out! the only thing i regreted was chosing her over the cat? the cat was definatly easier to live with..
Quickly, GUARD THE CAT !! He is probably in danger. I’m not kidding.